I’ll do another entry on the food I liked but mostly the trip made me appreciate the food we have back home which is way cheaper and more suited to my taste buds. Guess I am not very adventurous when it comes to food. 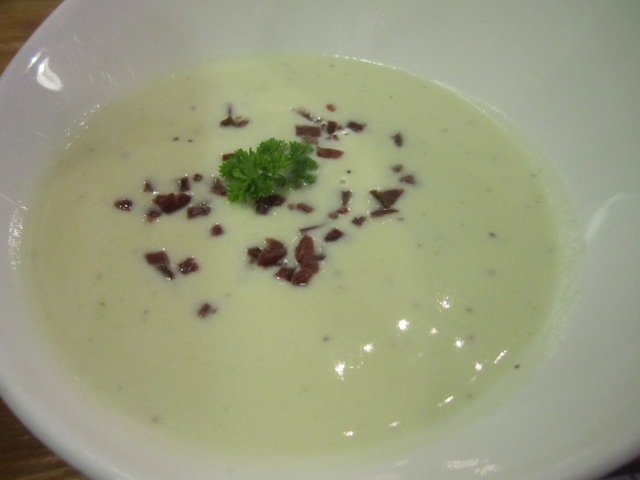 But I thought it would be a shame not to try the cheese soup with reindeer which the nice girl at the Market soup stall was recommending or the fish soup which she said was the most popular item. I found the fish soup too fishy and the reindeer bits extremely salty. It was like extremely salty bacon bits. And cheese soup just tastes weird. I think I will stick to melted cheese on my sandwiches. I am sure all this is acquired taste as the store was packed to the gills and people finished their soups relishing each spoonful to the last drop. I felt like such a typical tourist. 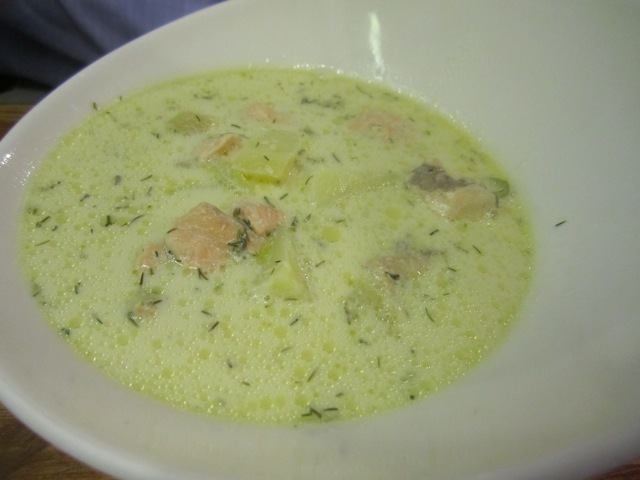 I think if you enjoy salmon you’ll like the fish soup. But I am terrible and don’t know how to appreciate salmon very much. Give me beer battered fish and chips please. Because we were trying to keep costs as low as possible, we tried the local fast food place. It was everywhere and it’s called Hesburger. I made the bad choice of ordering a pasta cabonara. It turned out to be very cheesy and it has a weird sort of mustardy curry taste to it. I just felt like I was eating crap. It was tasted like it was not freshly made and just instant stuff that was reheated. And things tend to get microwaved to very high temperatures or not at all. I found food either cold or too hot. Sounds sort of like a Goldilocks complaint. And the bun that came with the meal was cold and stale. It was a bit like a very bad airline meal. I tried the hot chocolate here and it was super sweet and awful. Ok now comes the disclaimer. In my next post I will write about something I ate at Hesburger that I liked. And I will say that the staff behind the counter were cheerful and polite. This entry was posted in Travel and tagged awful, bad, Finland, fish, Food, Helsinki, Hesburger, market, Pasta, personal, photography, photos, reindeer, soup, terrible, travel. Bookmark the permalink. I did see quite a number of kebab stalls, now that you mention it. It’s a pity I can’t appreciate seafood. I do like crab, local style, but I don’t really crave for it. 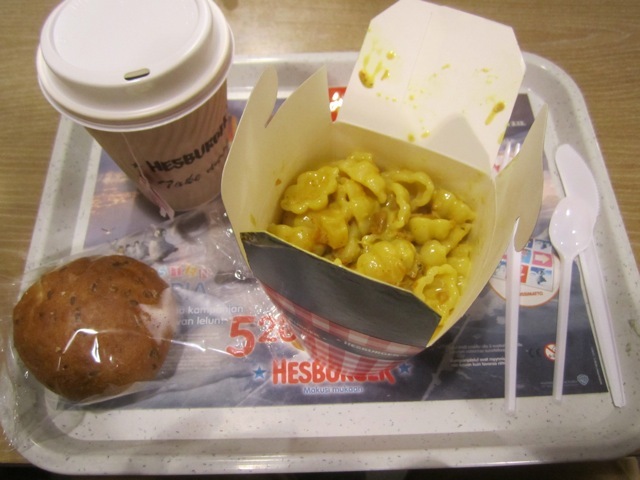 Hehehe I did Macs too 😉 I tend to go for American food….it’s my comfort food besides my noodles. I like experiencing Macs or KFC etc. in different countries. In London many years I had the best hot cocoa there.